I know, it's called a chin rest. And the Kun thing is more of a collarbone rest, which is another misnomer for another day. Today in my lesson with Alexander Technique teacher/bodymapper/violinist Jennifer Johnson, we talked about how the chin rest which should really be called a jaw rest. When we hear chin rest, whether as an adult or child, we invariably think our chin goes on the rest, and we often turn our head extremely out to the left and press down with our head to "keep the violin up." Using the chin rest as a point of contact with the "Chin" rather than allowing the back of the jawbone to make contact. When you look at Benedict Bones in the first image, you'll see that the portion of the body contacting the chin rest is the chin when the head turns out extremely to the left. Few people have the violin or viola set up so that the head is in neutral and not turned out to the left, but notice how much you turn the head to the left. Some students were told to look at their hands when first learning the instrument, but you can look without turning your head. Others combine the head turn to the left with elevation of the scapula, which can lead to long term tension and discomfort. Look at your setup or your student's: How much muscular work is happening in the back of the neck and the left side? What's happening in your jaw? Do you clench the jaw to hold the instrument up? Do you roll the head to the left or push the head down? I tend to agree with the image above, which shows the head in a pretty neutral position, bobbling from the AO joint rather than extremely turning the head to the left. See the difference when the head is more neutral (image below)? The jaw bone is in contact with the rest, rather than the chin. Now you might say, "Oh, I'm going to drop it!" First of all, the instrument is contacting many parts of your body besides your mandible. Your hand is holding it, it's resting on the collarbone, it might contact your left neck, and your bow friction is helping matters too! (Thanks to Jennifer Johnson's awesome book for listing those 5 places of contact). We definitely don't want to push down or down and forward on the chin rest to hold the violin, so play around with positioning this week and start to notice where you contact your chin rest! 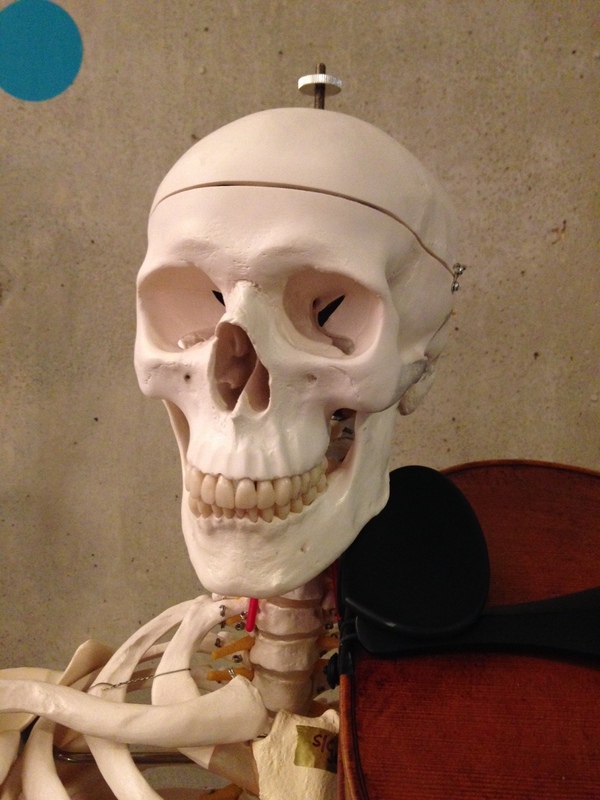 Notice that the back/side of your jawbone actually contacts the chin rest. The chin is a layperson term which can also lead people to crazy head positions.